famously, this “impenetrable forest” also protects an estimated 320 mountain gorillas – roughly half of the world’s population, including several habituated groups, which can be tracked. Day 1: Briefing on the safari, transfer to Bwindi impenetrable Forest, southwestern Uganda for your gorilla trek. Meet and greet with our local guide over breakfast, and then after drive heading to southwestern Uganda. En route, there is a local community popular for making local drums and crafts and a fruit market. Stopover, admire and buy yourself souvenirs. Proceed to the Equator line taken as one beautiful scenery in Africa - the pathway of the sun and take photographs. Pass by mountains, tropical rainforest and bamboo forest during the nine hour journey. 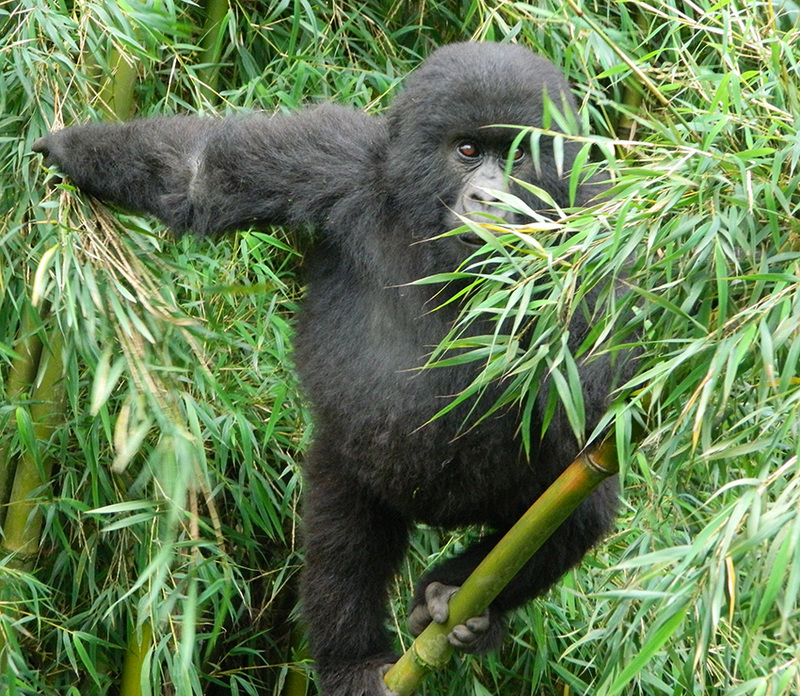 Today enjoy gorilla tracking in Bwindi. After breakfast, proceed for the morning briefing before enjoying the highlight of the trip- Gorilla trekking, which may last the entire day. 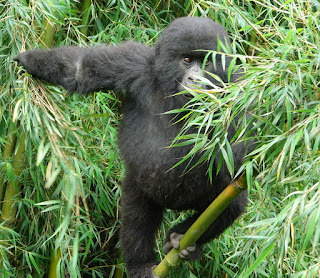 We trek the gorillas through the rain forest and bamboo covered slopes, accompanied by a guide and trackers, in search of a mountain gorilla family. The walking can sometimes be tough and long, but when you catch a glimpse of the magnificent silverback, any discomforts will be quickly forgotten. When the gorillas are sighted, visitors will be guided to within 6 metres from the gorillas, sit around them for a whole hour while gazing into their big round eyes. While most of today's forests are no more than 12,000 years old, Bwindi's vegetation has been weaving itself into tangles over at least 25,000 years, in the process accumulating a lengthy species list. This includes 310 species of butterfly, 51 reptiles, 200 trees, 88 moths and an exceptional 120 types of mammal including 10 primates. The latter includes chimpanzee, L'Hoest's, red tailed and blue monkey, black and white colobus, baboon, and Bwindi's most famous resident, the mountain gorilla. Bwindi is a prime destination for birdwatchers. Its 350 species include seven which are IUCN red data listed and 90% of all Albertine endemics, species which are difficult or impossible to see in any other part of East Africa. After breakfast we drive through stunning savannah grasslands as we head to the southern sector of Queen Elizabeth National Park, Ishasha a much more remote and less-traveled part of Queen Elizabeth National Park, but one which has a sense of exclusivity and remoteness. The game densities here are high, and this region has reported some of the largest herds of Elephant anywhere in Uganda, as it is their main migration corridor between Uganda and the DRC. As we enter the park, we do a game drive in search of the wild game. We continue and drive to the northern circuit which is the area near the main road known for its tree climbing lions. We look particularly at the many fig trees where lions like to stay. But we also visit the Uganda kob mating ground which is their preferred hunting area. We set out early in the morning for a game drive in the northern part of the park on the Kasenyi Track in search of lions, elephants, solitary buffaloes. This is the best time for opportunities of viewing the cats in action owing to the vast population of Uganda Kobs. We have an excellent chance to view just about every animal here at very close range. In the afternoon we will go for a launch trip along the Kazinga Channel. This gives you the opportunity to view wildlife up close: hippo’s huff and spray at a mere feet away from the boat, buffalo linger in the shallows. The shores of the channel are also home to an array of birds including pink backed pelicans, pied and malachite kingfishers, saddle billed stork and many others. Breakfast and head for Kampala (about 5 hours driving) via Mubende. This route travels through breathtaking scenery and delightfully rolling plantations, some of the best in Uganda. Depending on how much time we have on us we can tour around Kampala’s crafts and souvenirs markets before checking in at your hotel or being transferred to the airport.